Udayana, the author of Atmatattva-viveka was a Maithila brahmana by birth and flourished in the second half of the tenth century. Besides his celebrated work Atmatattvaviveka, he wrote Laksanamala. Nyayakusumarijali, Nyayaparisuddhi and Kiranavali on Praiastapada's Padarthardha rmasamgraha. 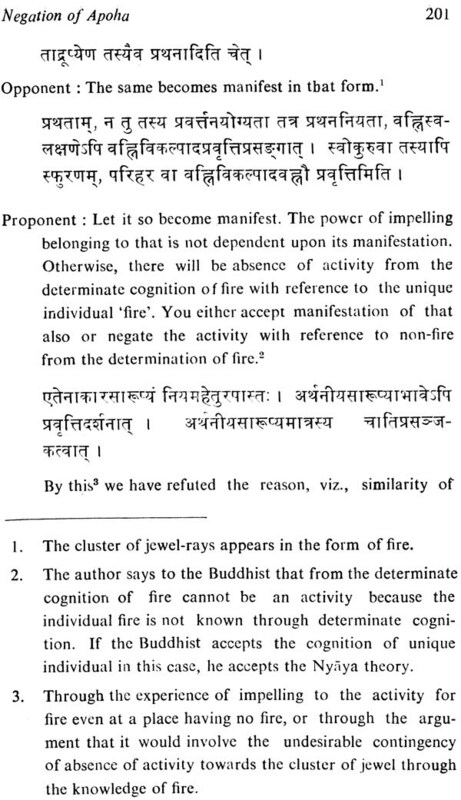 The Subject discussed in Atmatativa-viveka is the acceptance or the rejection of the soul that constitutes a prominent demarcating line between the two sects of philosophical systems—brahmanical and the Buddhist. Udyana took a comprehensive note of Buddhist philosophy and is considered to be the last word in the controversy between Buddhism and Nyaya. The Atmatattvaviveka, therefore represents a landmark in the controversy between the Buddhists and the Naiyayikas. The present work was undertaken by (late) Dr. (Miss) Chitrarekha V. Kher in course of her studies for Ph. 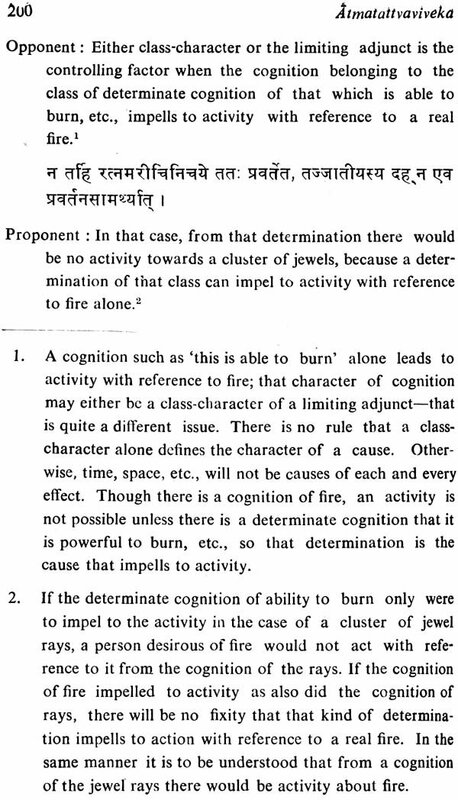 D. on Buddhism as presented by Brahmanical systems. The through understanding of the Atmatattvaviveka requires a profound Knowledge of Buddhism and the brahmanical systems specially the Nyaya. No one was better fitted for such a work than Dr. Chitrarekha kher However, the premature death carried her off at a time when she was most needed. Naturally, the work suffered a great setback. She left behind her ample material on translation which required a final revision. I tried my best to find out a scholar fit for the present work, but my efforts could not bear any fruit, and the work could not be brought out of its frozen state. The urgency of the work and the friendly insistence from all sides prompted me to undertake it to its completion with the addition of the explanatory notes. Though a great task, it was a sacred obligation that I owe to my teacher]. I must evince gratitude to Dr. S.M. Shaha who encouraged me during the present venture. I am also thankful to Sh. Sham Lal, Prop. Eastern Book Linkers, Delhi who willingly undertook the publication of the work. It prepares a firm ground for me to continue the rest of the portion on the same lines. Indian philosophy basically aims at the removal of misery. Such a thirst resulted into the search for the causes of misery and the means for removing it. The limitations of the worldly means open the direction for the attempts at a logical explanation of the problem of the Reality and a reasoned expression of the spiritual experience. Such attempts were basically prompted by two lines of approach, viz., the acceptance and the rejection of the Vedas as the authority in the worldly as well as the spiritual matters. The followers of the earlier approach were termed astika (orthodox) and the others, the nastika (heterodox). Naturally the nastika systems signify an antagonistic attitude in a high degree to the vedic literature and developed a negative attitude to those matters which were of crucial importance in the astika systems and formed the main plank of the ethical, religious and philosophical teachings of the astika systems. Thus, the nastika systems stood against the essential factors of brahmanic culture like sacrificial and ritualistic practices, the distinction among men based on four social classes and a positive outlook towards life. [Thus was marked a line of demarcation between the astika systems like Nyaya, Vaisesika, Samkhya, Yoga, Purvamimamsa and the Uttaramimamsa on the one hand and the nastika systems like Buddhism, Jainism and carvaka on the other]. The Buddhism sponsored a monk-ideal as the symbol of good life. In the philosophical sphere, the Buddhists deny the soul as supported by the theory of universal flux which resulted into the denial of any enduring thing, the substance, a whole of an act, real relation, causation as a real process, time, etc. The Atmatattraviveka represents a landmark in the controversy between the Buddhists and the Naiyayik as. The Nyaya system has waged a fierce and continuous intellectual warfare with the Buddhists from the very beginning. Gautama and Vatsyayana criticise many doctrines of the Sarvastivadins (specially the Sautrantikas), the Vijnanavildins and the Silnyavadins. Dinnaga from the Buddhist side threw many blemishes to the Nyaya system and was criticised by Uddyotakara who was in turn severely criticised by Dharmakirti as also Santara-ksita and Kamalasila. Vacaspati Misra and Jayantabhatta carried out the task of defending the Nyaya system against the onslaught of the Buddhist logicians. Vacaspati Mira and Trilocana were severely criticised by jnanasrimitra and Ratnakirti. Udayana took a comprehensive note of Buddhist philosophy and is considered to be the last word in the controversy between Buddhism and Nyaya. Udayana was a Maithila brahmana by birth and flourished in the second half of the tenth century. Besides his celebrated work Atmatattvaviveka, he wrote Laksanamala, Nyayakusumanjali, Nyayaparisista, Nyeyaparisuddhi and Kiranavali on Prasastapada's Padarthadharmasamgraha. 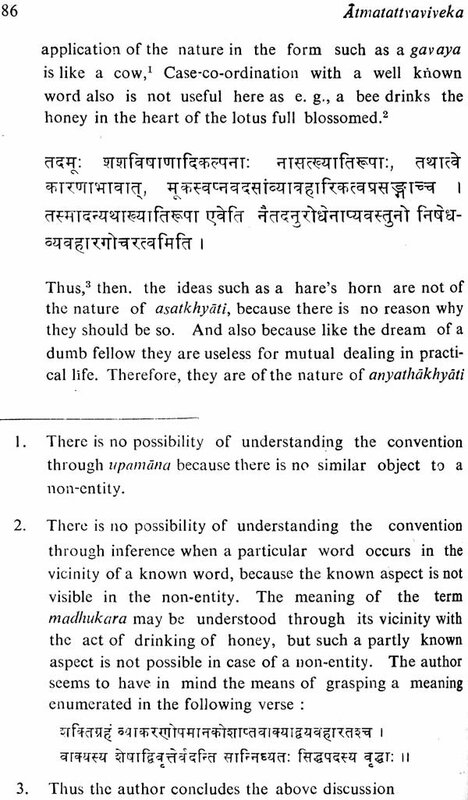 The subject discussed in the Atmatattraviveka is of crucial importance in Indian Philosophy. The acceptance or the rejection of the soul constitutes a prominent demarcating line between the two sects of philosophical systems —brahmanical and the Buddhist. Udayana has, therefore, discussed the most important issue in Atmatattvaviveka. 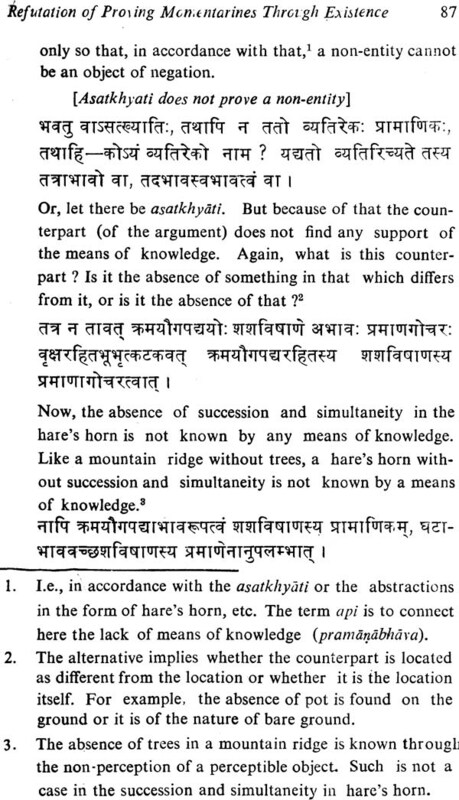 It would be worthwhile to review briefly the above controversy in Indian Philosophy. The issue of the existence and the nature of soul has been a subject of deep probing in the systems of Indian philosophy. The Naiyayikas assert that the souls are permanent entities as the substantives of the qualities of desire, pleasure, pain, etc. The Vaisesikas subscribe to the same with the addition that it can be directly perceived. The Samkhya and Yoga hold that there are many permanent souls which are conscious but inactive. The Parvamimarhsakas also believe in souls to be numberless permanent conscious entities. The different schools of Uttaramimamsa unanimously accept the existence of soul with their internal differences regarding the details. The Jainas opine that there are many permanent and conscious souls having the dimensions of the respective bodies. The carvakas believe that the body is all-in-all and do not worry about any-thing like soul. The doctrine of the permanent soul is an anathema for the Buddhists. They hold that the soul generally understood by the notion of 'I' is merely a bundle of five different elements called skandhas. There is no soul apart from the vijnanaskandha. Vedana (feeling), samjna (idea), cetana (volition), manas (mind) and samskaras (impressions) are the forms of vijnana only. Vinana has the capacity to know and to enjoy. The soul comes to be a conceptual construction. The Buddhists find no reality of soul on the ground that the functions attributed to the soul can well be performed by the continuum of momentary consciousness. Moreover, the facts of agency and enjoyment signifying change and movement are incompatible with an eternal and all-pervasive character of the soul. If the change of state is denied, there can be no real agency and experience and as a result the soul comes to be as good as a non-entity.